We thought this was great news for Dodge… Come in and check out what other things we have going on here at Prince Frederick Chrysler Jeep Dodge, including 2010 Ram trucks! Chrysler Group LLC announced yesterday that it is revamping its powertrain lineup with some technology assistance from Fiat that will increase the overall fuel-efficiency of its lineup by 25 percent during the 2010-2014 period. 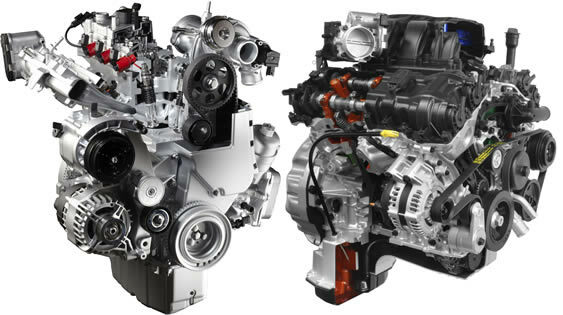 Chrysler will expand its 4-cylinder engine choices with the introduction of Fiat Powertrain’s 1.4L, in-line 4-cylinder Fully Integrated Robotized Engine (FIRE) featuring Multiair. 4-Cylinder options will include a 100-hp 1.4L I-4 FIRE with Multiair, a 170-hp 1.4L I-4 FIRE Turbo with Multiair and a 190-hp 2.4L I-4 World Gas Engine with Multiair. The Auburn Hills automaker will also upgrade its V6 engine offering with the new fuel-efficient, 3.6L V6 Pentastar engine. Producing 280-hp and a peak torque of 260 lb-ft, the first application of the V6 Pentastar will debut in the 2011 Jeep Grand Cherokee , due out in the second-quarter of 2010. Further making improvements to fuel-efficiency, Chrysler said that it will introduce Fiat’s six-speed Dual Dry Clutch Transmission (DDCT) to mid-size D-segment cars later this year. The application will provide a 10 percent increase in fuel-economy. Click through for the press release for more details. We thought this was pretty cool. Ever wonder how your new Dodge Challenger is made? Well wonder no more and think of it as the ultimate field trip for grown ups: Peter Carey and a video crew visited Chrysler’s Brampton Assembly Plant in Ontario to get a true behind-the-scenes look at the assembly process for the Dodge Challenger. In this video, he learns that it takes about 24 hours to take a Challenger from framing to the end of the line, with more than 2,400 workers building Chrysler 300s, Dodge Chargers, and Challengers at the plant. Something is going on pretty much everywhere you look at Brampton — even above your head. After your done droolling over this video, come on by your favorite Maryland Dodge Dealer and check out some in the flesh ones. Be careful though you might just end up taking one home. Introduced in 2008, the Ram 1500 is a game changer in terms of its ability to “outsmart” and “out-tough” the competition with its bold exterior design, crafted and refined interior, engineering excellence, superb innovation and best-in-class features, amenities and ride quality. Customers specifically noted that the Ram 1500 has the best added storage capability along with the best truck interior ever rated by customers. The Ram Truck brand adds to its award-winning lineup with the recent introduction of its all-new 2010 Ram 2500 and 3500 Heavy Duty trucks. The new heavy-duty trucks provide customers with first-time innovations and features, along with new standards of strength, utility and driveability, building on the Ram’s leadership in the heavy-duty pickup segment. Ram Truck will further enhance its commercial vehicle presence with the introduction of a “new crew” of commercial-grade work trucks: the all-new 2011 Ram 3500, 4500 and 5500 Chassis Cabs. Led by an all-new crew cab, the new 2011 Ram Chassis Cabs are built on a proven frame and chassis and engineered for maximum uptime, optimum performance and enhanced commercial capability. Thought I would share a funny video with you… 1970 Dodge Challenger commercial. Enjoy. Entering the Chrysler display promised to yield few surprises here at the Detroit Auto Show. The automaker doesn’t even have a press conference scheduled – mostly because there isn’t a lot happening new product-wise. But that doesn’t mean The Pentastar doesn’t have anything to be proud of, including the latest iteration of the Dodge Ram Heavy Duty, which was recently named the Motor Trend Truck of the Year. 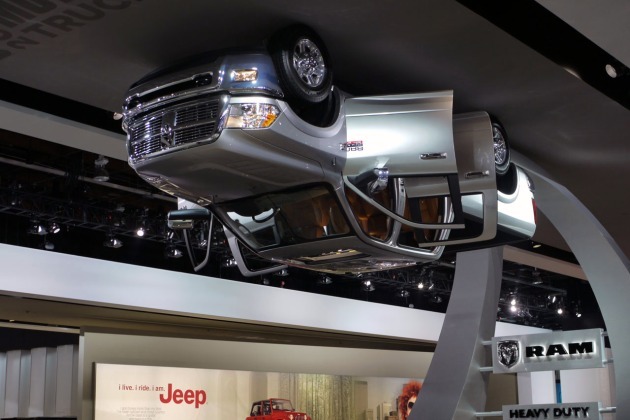 Ostensibly to celebrate that award, but probably more likely to add a little excitement to its booth area here in Detroit, Chrysler has somehow managed to attach a brand-new 2010 Dodge Ram Heavy Duty to the ceiling of its display. So, if you plan on visiting Detroit this week to see all that the world’s finest automakers have to offer, make your way to the Chrysler booth… and keep your eyes skyward. Make sure to stop by your local Maryland Dodge Dealer to see for yourself why the Dodge Ram is Truck of the Year. I was online looking for fun stuff to blog today and thought our performance lovers would have fun watching this video of a 2008 Challenger on the drag strip. Want to see a 2010 Challenger? Stop by Prince Frederick Chrysler Jeep Dodge on Rt 4 in Prince Frederick. Here’s some great stuff on new models that you should see at Prince Frederick Chrysler Jeep Dodgein the upcoming months. A few weeks ago, everyone was wondering when The Chrysler Group was going to have anything new to show at next week’s Detroit Auto Show. You can look at the latest news about potential Ram models, Chrysler’s special editions and Dodge’s just-unveiled offerings either as wheezing gasps, or signs of pointing in the right direction. Since it’s a new year, we’re going to give Chrysler (and Fiat) the benefit of the doubt… for now. Dodge says it “has taken ‘base model’ out of its vocabulary” by moving heaps of kit from the Options column to the Standard column on cars like the Journey, which for 2010 will automatically receive 17-inch aluminum wheels, cruise control, sunscreen glass, body-color mirrors, floor mats and passenger grab handles. It has also added “Heat,” “Hero,” “Crew,” and “Uptown” packages to the Journey’s options list for those who like trim names that sound like they came from an SNL skit. 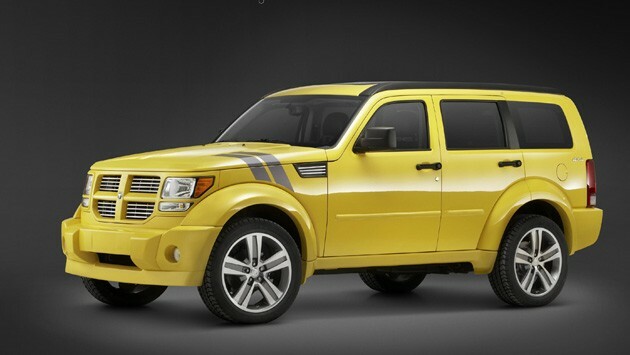 Four of Dodge’s other models – the Nitro, Avenger, Challenger, and Viper SRT10 – get their loving spoonfuls as well. You can read all about them in the Pasternak-length press release at the link below, and check out the Nitro Detonator and Viper ACR in the high-res gallery of photos.